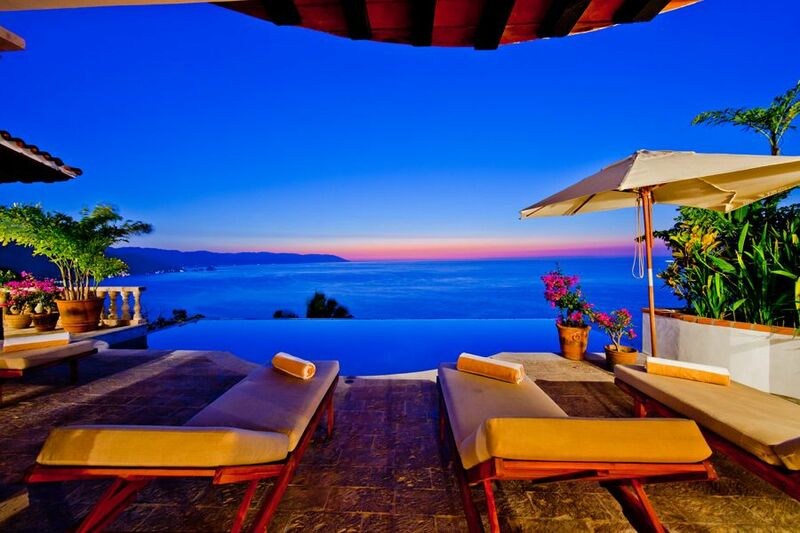 Casa Del Quetzal Luxurious villa with spectacular view. Near downtown and beach. Luxurious hacienda style villa with spectacular view of Bay of Banderas. All bedrooms, baths, living room, dining room, 35 foot infinity pool overlook ocean. Unique brick ceiling fashioned by artisans of central Mexico. Large stone courtyard with fountains surrounded by wooden beamed loggia. Living room / dining room open to ocean, courtyard, and small patio with fountain. Fitness room with elliptical, treadmill, stationary bike, tv and ipod dock. Media room with Wii game system. Wifi. Ipod docks. Stone terraces extend from all bedrooms and baths. Garden down below. 5 minutes from beach, 7 minutes from downtown. Fabulous staff of three including amazing chef. BR B Amenities: /B BR All bedrooms have remote control air conditioning. Full service---maid, cook, gardener. 2 car garage. TV, VCR, satellite TV, tape and CD player, ipod docks, media room, fitness room, wifi, vonage phone and local phone. Great admirers of Mexico---historically and present. Love to travel! Best of all worlds in Mexico: Colonial City, second largest bay in North America(no commercial vessels allowed), Sierra Del Sur mountain range(greenery), semitropical jungle,wonderful restaurants!, numerous attractions for singles and families! We designed and built the villa in an attempt to bring our guests some exposure to the vast cultural aspects of Mexico---Precolumbian Civilization, Colonial Mexico, and the present cultural scene--art and artisans. Remote control for each bedroom. What a gorgeous villa! We had a wonderful time! The staff is outstanding! We did not want to leave! Thanks again for choosing Casa Quetzal. So glad you enjoyed your stay. Hope you can return sometime! Wishing you and your wife all the best. Went with a group of 9 girls and had the most incredible trip. The house is unbelievable, pictures don't even do it justice. The staff was next level and made our stay truly wonderful. Absolutely must go back to this house!!! We look forward to your return! Thank you for choosing Casa del Quetzal. Best vacation ever. This villa and staff met all our expectations and went beyond. Beautiful property with unreal views. Can't wait to go back. Thank you. We can't wait to have you back! I cannot say enough wonderful things about this place. It is beautiful!!!! The staff is unbelievable and truly made us feel at home. I cannot wait until our next trip back!! Glad to have had you and we look forward to your return. We had such a wonderful time at Casa Del Quetzal. The home was beautiful and the view was to die for. The staff was great. The food was delish and they catered to our group of 10, which included 4 somewhat picky children and a vegetarian. I sincerely hope we can go back. Casa del Quetzal is a luxurious 5 bedroom villa located very conveniently to the beaches and restaurants of Puerto Vallarta. Located just up from downtown in the upscale neighborhood of Conchas Chinas, you will melt away the days being pampered by our staff. Amenities include a private heated infinity pool with an amazing view of the Bay, fitness room, media room with a Wii game system, kitchen, laundry room, garage, jacuzzi bath in master bath and more. Beautiful Puerto Vallarta is Mexico's premiere resort city. Nestled within the Sierra Madre Mountains overlooking the second largest bay on the American continent, the city is renown for some of the most beautiful sunsets in the world. The landmark for the area is the Church of Our Lady of Guadalupe with its unique glass dome. The area offers a cultured grace with some the most talented artists, architects, and chefs in North America. Approximately 120 restaurants and entertainment facilities are available throughout the region---including many of 5 star quality. Art galleries dot the city and include the work of local legend Manuele Lupe. The local museum contains an interesting array of pre-Colombian artifacts. Shopping is unsurpassed with many upscale shops as well as one of the largest local craft markets in Mexico. Numerous beaches surround the bay. All activities common to seaside resorts are readily available. Concierge service is available to our clients.